Three proficient Brazilian skateboarders highlight the invite list for X Games Foz do Iguaçu as they will go for gold in their home country next month. 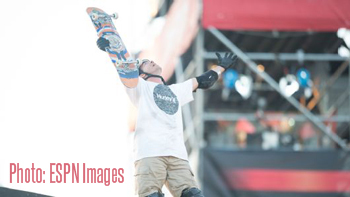 Pedro Barros will defend his gold medal in Men's Skateboard Park, Bob Burnquist will also try to repeat in Skateboard Big Air, and Sao Paulo native Leticia Bufoni hopes to improve on her silver-medal performance in Women's Skateboard street. But the locals will have a run for their money as X Games announced the full invite list on Thursday. Burnquist will be challenged once again by a crop of young Skateboard Big Air specialists led by Mitchie Brusco and Tom Shaar. While Barros has won nearly every competition he entered in 2012, Grant Taylor, Andy Macdonald, Raven Tershy and the rest of the field won't go down easily. And Bufoni will have to overcome defending gold medalist Alexis Sablone to top the podium in Street for the first time at an X Games. Also invited are X Games mainstays Travis Pastrana, who is joining Ken Block and Brian Deegan in RallyCross; Jamie Bestwick will try for his unprecedented seventh-straight BMX Vert gold medal; And Ryan Nyquist leads the field in the return of BMX Dirt. Despite the cancellation of Moto X Best Trick, the moto field is strong with Nate Adams and Taka Higashino in the mix for Moto X Freestyle. In addition to the on-site competition, several of the world's best surfers will be facing off in the debut of Real Surf for X Games Foz. Brazilian Gabriel Medina is sure to be the local favorite as he puts his aerial expertise on display in the popular video part bracket contest, but current ASP World Tour points leader Kelly Slater should have a few tricks up his sleeve, and high-flying Julian Wilson should contribute an epic part. X Games Foz will be held April 18-21 in Foz do Iguaçu, Brazil.